Lies, damned lies, and archaeology blog statistics. For this month’s Blogging Archaeology we’ve been allowed a long lead. It appears that Doug’s fund of challenging, pertinent questions has tipped into the red after a fleeting period of fecundity, and we have to come up with our own now. Being tremendously idle, I’ve decided instead that Doug’s own contribution to his Festival of Bloggery, or whatever it’s currently parading as, will be the theme of my own contribution. Doug has chosen to muse on the subject of web statistics and why only 38% of you will have got beyond the first sentence of this, his, or any other blog post. According to Slate, anyway. It also uses the phrase ‘digital archaeology’ inappropriately so, you know, I’ll certainly be addressing that too. Off the top of my head I think that perhaps not writing about statistics is statistically likely to increase the number of visitors that make it past the first sentence, but rather than make things up as the fancy takes me, I’ll be looking at the statistics from my own website, and making up things about those instead. And if you’re still reading, here’s a picture of a pie-chart, guaranteed to thin the herd further. A herd-thinning pie chart of visitor statistics. Still reading? What’s wrong with you? You’re giving me the creeps now. So now there’s just the two of us left, we can talk properly. I’ll put the kettle on. Back in a minute. Oh – while I’m gone you can watch this distracting gif. Here you go. I didn’t know if you took sugar or not, so I haven’t stirred it. I found some fig rolls too. No it’s fine – I’m actually glad they’ve gone. That one with the beard smelled distinctly off. I know they all had beards. It was an archaeology joke. Vodka? No, I suppose it is a little early. Right. Doug actually raises some points that I’ve recently been looking at myself, so this is a very handy elision, and one that I’m happy to help with. Stats aren’t for everyone, including me, but I would just like to talk about a couple of very easy steps you can take to get a much better overview of who is looking at what, how long for, and from where. The level of detail about the users habits and hardware may surprise you. Oh dear – perhaps I shouldn’t have put that gif there – it’s distracting isn’t it? Scroll down a bit so it disappears. That’s better. Anyway, let’s have an explore. Doug said that WordPress statistics are pretty blunt affairs, and that it would be nice to know more about how people were interacting with your pages. This is certainly true, but by installing a Google Analytics plugin (such as this one here) you can get a much clearer idea of how people are finding your site and which pages are attracting the most attention. You of course need a Google Analytics account for this function, and you also need to instert some tracking code into your pages. Luckily that there plugin takes care of that for you too. The stats on the panel in generates are handy hints, but if you want to go deeper still, you should really spend time getting to know your results on Google Statistics proper. How much did they read before giving up? For instance Doug mentions that it would be good to know how long a person has spent on a page – this will of course be an indication of how much of the text that person has read. But it is only ever an indicator, and it is always expressed as an average, so there are some difficulties there. If your page has attracted 1,000 visitors, and the average time they have spent on a page is 2 minutes, how can you tell if all of them read for two minutes, or some read for ten minutes, and some jogged on after the first few seconds, having realised that this place, out of the whole of the internet, was exactly where they didn’t want to be? In short, you can’t. You can’t even tell if the tab they opened that page on was ever the focus. They may have clicked your link as they were reading another page, and never looked at yours at all. But it does have its uses – if the average time spent on your page is 0.3 seconds, then it’s clear you’re doing something wrong or, by dint of a quirk in someone’s search algorithm, people who have no interest in your interest are being guided to your site. It depends – you can do a load of work and change things so people don’t roll up on your doorstep by accident, or you can leave it, because even meaningless traffic is less depressing than no traffic at all. Next, you could try sailing with a wind-sock. Or write about things that people actually like to read about. There’s always that. Referral traffic is very useful to know about because it will tell you where people they are gathering to whisper menacingly before organising groups to land on your pages and then bugger off after 0.3 seconds or less. These places include Twitter and Facebook and Google Plus, as can be expected, but they can also tip you off about corners of the web you hadn’t really been aware of before now. Stumble-Upon, Reddit, and a quosillion forums you never even suspected existed, let alone had enough members to make a dent in your statistics. The thing is, a small readership is better than a wide readership who aren’t really getting very far into your posts. 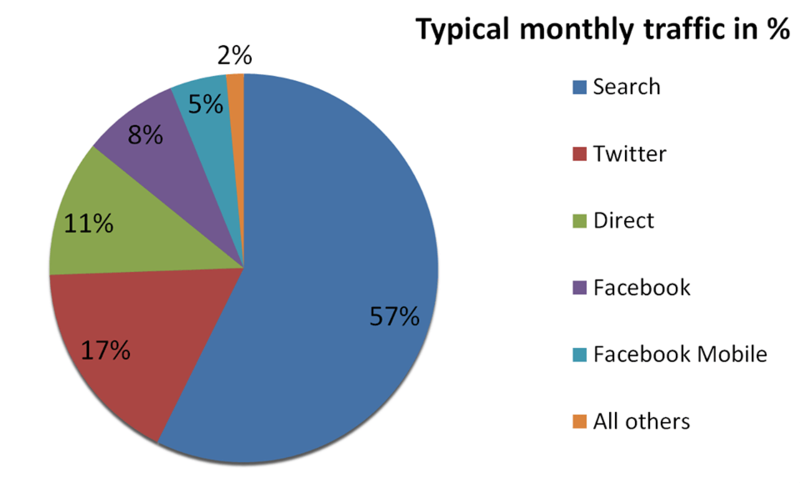 For instance, if you look at the pie chart above, you’ll notice that Twitter points more people in the direction of DD than Facebook and Facebook mobile combined. However what the raw numbers don’t tell you is that although Facebook provides fewer visitors, they tend to stay on the page for longer, and also click on three times more pages than Twitter followers. They are, in short, far more engaged. DD also receives a small but significant flow of visitors from dedicated archery groups who are interested in how Stuart Prior built a Neolithic flat bow. It’s niche groups such as this who will actually finish reading a page and, equally importantly, return to your site, and link to it in their own forums. This is the stuff from which decent Google rankings are made. What technology did they use to view my site? This is both important and not terribly important, depending on how much you can bring yourself to care about it. If you’re a web developer it’s gold-dust. It may surprise you to learn that I can not only tell which country (actually from the nearest major settlement) you’re viewing from, I can also tell which version of which browser you’re using, which version of which operating system you’re using, and what resolution you’re screen is set to. This may sound like an appalling intrusion, but not so long ago web developers had to write different versions of websites depending on this information. This information is probably not relevant for a casual blogger, or anyone less than a developer, and its relevance continues to decline for two reasons – the first is that reflexive websites are now commonplace and adapt to the users hardware and screen size, and the second is that most developers have finally decided that Microsoft can, after years of screwing with the scene, go and screw themselves instead. In short, if you’re even vaguely interested in knowing more about your readership, install Analytics and do some digging. The results may be unexpectedly pleasing, or a horrible wake-up call. If you’re not, then you probably won’t have read to this bit anyway. If you have, then I’m sorry I doubted your tenacity. Vodka? That’s the spirit. Yes, I’m actually glad it’s just us now. No, I didn’t finish Doug’s post. I didn’t really finish this one either. While I was typing this, Doug updated his blog, and admitted to killing Blogging Archaeology. As I suspected in my first post, this was his intention all along. He led us like so many rats chasing mindlessly after a tune, some pointy shoes and hat with a bell on the end. He gave us hope, but essentially led us out of town, and abandoned us while he doubled back and locked the gates. Well done Doug – it’s Your Archaeology now. You deserve it. This has become one of my favorite posts ever. Thank you.